If you're looking to build wealth over decades, look no further than these three very different companies. One of the best ways to profit with stocks is also one of the simplest: Find great companies, buy them, and then hold them for as long as you can. And while simple isn't always easy -- try holding a stock that falls by 40% during the next market downturn -- it has proven to be an excellent way to generate life-changing wealth. We challenged three investors to give us some seriously long-term ideas with a simple question: "What's a stock to buy and hold for 25 years?" They came up with CareTrust REIT Inc. (NASDAQ:CTRE), Alphabet Inc. (NASDAQ:GOOG)(NASDAQ:GOOGL), and Visa Inc. (NYSE:V). And when we asked them why, they really gave us something to get excited about. Here's why owning these three growth stocks could make you very happy for the next 25 years -- or even longer. Jason Hall (CareTrust REIT): Baby boomers are moving into retirement age in full force, with around 3 million turning 65 every year between now and 2029, when the youngest boomers reach Medicare eligibility. By 2030, there will be 80 million American seniors, around half of whom will be 80 or older. And even with advances in healthcare, better outpatient and in-home treatment and assistance, a substantial portion will find themselves in need of specialized healthcare and senior housing facilities, either on a temporary or permanent basis. And I think CareTrust, a small (but fast-growing) specialist, in owning those kinds of properties, could be a huge winner for investors. CareTrust currently owns just shy of 200 properties, more than double the 94 it had when it went public in 2014. This expansion has not only increased cash flows, but also decreased the concentration of those cash flows from its biggest tenants, lowering its risk profile while simultaneously growing investor returns. 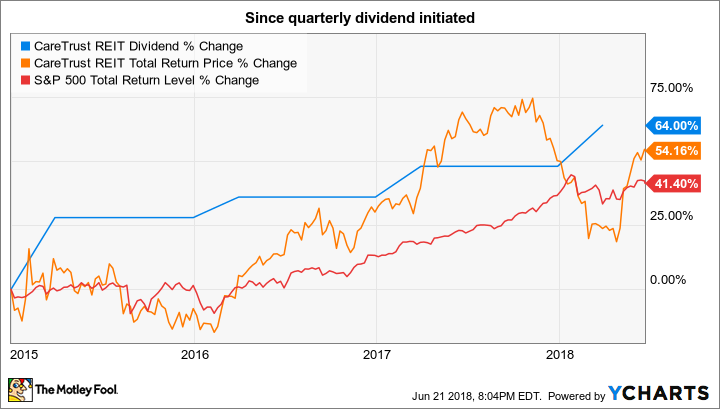 CareTrust has increased the payout of its quarterly dividend a remarkable 64% since the first payout in late 2014, and as a REIT -- real estate investment trust -- it is likely to continue increases so long as management continues growing the business and its cash flows. With the steady growth in the older population set to last multiple decades, I'm counting on CareTrust's management to do just that. With a yield pushing 5% at recent prices and a major long-term trend set to drive steady growth, CareTrust is an ideal multidecade investment. Jordan Wathen (Alphabet): As the telephone book of the modern era, Alphabet's Google business has a long runway for growth that should power earnings growth for decades to come. Admittedly, I'm not sure what to make of the company's so-called "other bets," which include stakes in companies like Calico Labs, which is trying to find a solution to human aging, or Fiber, which is pushing the envelope for consumer internet speeds at an affordable price. Together, other bets posted an operating loss of $571 million in the most recent quarter, a drain on the $8.4 billion of operating income generated by the core Google advertising business. But even if Alphabet's science projects turn out to be money losers forever, I believe Alphabet stock can still generate a market-beating return due to just the advertising businesses. Google and YouTube have something of a royalty in online commerce, collecting a fee every time an internet user views or clicks an advertisement served up by Google's network. Best of all, search and video are two businesses that benefit from network effects. Each search trains Google to be better at delivering relevant content, while content creators on YouTube benefit from the contributions of others, which brings more traffic and video views. If there is one tech stock to buy and ignore for 25 years, Alphabet is it. Sean Williams (Visa): Set-it-and-forget-it stocks aren't easy to come by, but if you're looking to sock away a solid growth stock for the next 25 years for your own portfolio, or that of your children or grandchildren, I can't think of many better ideas than global payment processing giant Visa. The beauty of Visa is a combination of its incredible U.S. market share, a high barrier to entry in payment processing, and a massive market opportunity overseas. Back in 2006, WalletHub noted that Visa held a 42.5% market share in U.S. credit card network purchase volume, which was a little over 13% ahead of its next-closest rival. By 2016, Visa controlled almost 51% of U.S. network purchase volume, which is nearly 28% higher than the next-closest competitor, American Express. This dominant market share makes it the go-to for merchants in what could arguably be described as the most consumption-oriented market in the world. Visa and its relatively few competitors also benefit from a relatively high barrier to entry in credit processing. It takes quite a bit of capital to build the infrastructure needed to process and validate transactions, which removes a number of would-be competitors from the equation. Plus, Visa's rapport with merchants is an intangible that none of its peers, or prospective new entrants, can match. Might I add, this includes cryptocurrencies, which are considerably slower than Visa in terms of payment validation and transaction speed per second. Visa is also intriguing because it's hardly tapped markets in Africa, the Middle East, and Southeast Asia. Somewhere in the neighborhood of 85% of the world's transactions are still conducted in cash, leaving plenty of opportunity for Visa to spread its wings. Ultimately, we're talking about a company that's practically impervious to recessions given that it's not a lender (unlike AmEx and a few of its peers), and therefore has no risk to credit delinquency. By focusing solely on being a payment-processing middleman, Visa has found a niche where it's been able to grow revenue every year for more than a decade. With a steadily growing dividend, healthy cash flow, and a reasonable expectation of approximately 10% revenue growth each year, Visa is a safe growth stock to sock away for the next 25 years.